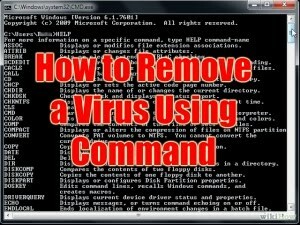 Have you ever tried to remove virus using command prompt ? Without using an antivirus ? :O Yeah that’s possible now. Virus is a computer program that can copy itself and infect computers. So, it is necessary to permanently remove virus using Command prompt. The term “virus” is erroneously used to refer to other types of malware, including adware and spyware programs that do not have the reproductive ability. A true virus can spread from one computer to another in executable code. One of the ways by which a virus can infect your PC is through USB/Flash drives. Common viruses such as ‘Ravmon’ , ‘New Folder.exe’, ‘Orkut is banned’ are spreading through USB drive when you inset it. in CMD “drivename:” eg. E: to go to E: drive. files of the drive including hidden files. find any .exe file which is unknown to you. then delete it using the same above method. Step 6: Done. Now enjoy virus free computer. If you face any problem in Remove virus using Command Prompt let us know and comment below we resolve it. If you like the trick “Remove virus using Command Prompt” keep following us on social media.